Pennsylvania - New public opinion survey results from Pennsylvania released today show strong voter support for new national policies that support working families, echoing national trends. 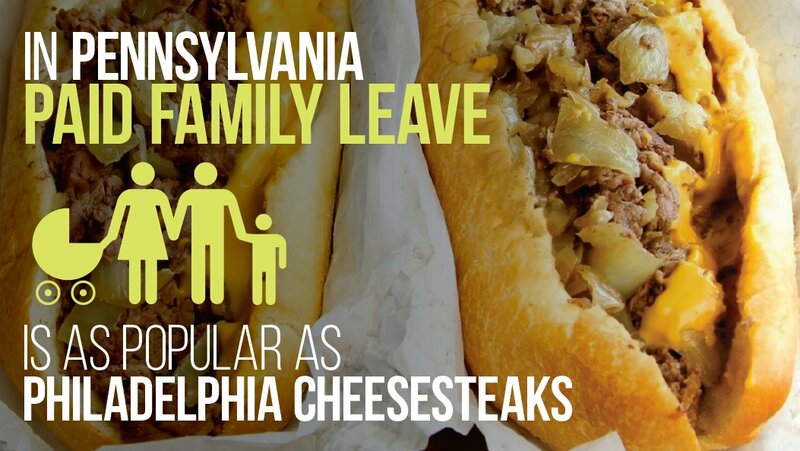 "The breadth of support is welcome but not surprising news," said Marianne Bellesorte, Vice President of Advocacy at PathWays PA. "Access to paid family leave helps spur our economy while keeping families safe. Financial protection for working families, whether they have a new baby or a new cancer diagnosis, is long overdue." Sixty percent of surveyed Pennsylvanians said it is likely that they would face significant economic hardship if they had to take time from their job to deal with a serious illness, to care for a new child or to care for a family member with a serious illness. Sixty-eight percent strongly or somewhat support a proposed law guaranteeing that working people in the U.S. can earn up to seven paid sick days each year from their employer to use if they or a family member has a routine illness like the flu or needs to see a doctor. By a nearly two-to-one margin, 61 percent of voters in the 15 states that were polled support the creation of a national paid family and medical leave fund, 69 percent support a paid sick days law and 57 percent support increasing access to high-quality affordable child care. Commissioned by the 15 national organizations that make up the Work Family Strategy Council, these new results provide further evidence of the strong public demand for policies that help people manage family and work responsibilities. Support for paid family and medical leave spans political parties: 84 percent of Democrats, 50 percent of Independents and 42 percent of Republicans say they favor a national paid family and medical leave fund. A strong majority of people surveyed say they face challenges when managing job, family and personal responsibilities: 63 percent of full-time workers and 67 percent of part-time workers say they would be likely to face significant economic hardship if they had to take time off without pay to care for a new child, care for a seriously ill loved one, or deal with their own serious health issue. Voters in all 15 states say they would be more likely to vote for an elected official or candidate who supports creating a paid family and medical leave fund. Voters also strongly support establishing a national paid sick days standard and increased access to high-quality, affordable child care: 69 percent say they favor a law that would guarantee all workers the right to earn paid sick days from their employers; only 28 percent express opposition. Additionally, 57 percent say they favor increased access to high-quality, affordable child care; 35 percent express opposition. "Our nation prides itself on having strong family values, yet we are the only developed nation in the world without paid family leave. The polling data confirms Americans want the ability to take care of their families while remaining in the workforce. Family Leave Insurance Funds provide a way for workers to care for their families while keeping our economy on track," said Heather Arnet, CEO of the Women and Girls Foundation located in Southwest Pennsylvania. "Of course there's broad support for paid leave," said Terry L. Fromson, Managing Attorney of the Women's Law Project. "Paid leave benefits both families and employers. People need to be able to care for babies and sick family members without being pushed out of the workforce, which is, unfortunately, what happens to women in particular." Despite the nearly universal challenges people face trying to balance the demands of job and family, only 12 percent of private sector workers in the United States have access to paid family leave through their employers, and only 61 percent have access to paid sick days. For lower-wage workers, access to paid time off to use for family and medical needs is even rarer. The new data suggest voters strongly favor changing these realities. "It would have meant everything to have paid family leave, or for my husband to have it now," said Jessica Karabian, a Southampton, PA, mother with stage IV cancer. "We wouldn't have to worry so much about cutting things for our daughter. Eloise is 3, but she can't go to preschool because we have to pay medical bills. I just don't you think you should have to go bankrupt because you're sick." FULL RESULTS for each state are available: Arizona, Colorado, Florida, Georgia, Iowa, Minnesota, Nevada, New Hampshire, North Carolina, Ohio, Oregon, Pennsylvania, Virginia, Washington, or Wisconsin or see the 15-State Aggregate. About The Coalition for Healthy Families and Workplaces: The Coalition for Healthy Families and Workplaces is made up of a group o organizations supporting the need for earned sick time in Philadelphia and Pennsylvania. About The Women's Law Project: Founded in 1974, the Women's Law Project is the only public interest law center in Pennsylvania devoted to advancing the rights of women and girls. About The Women and Girls Foundation: The Women and Girls Foundation is a non-profit community based organization in Southwest Pennsylvania. The mission of the Women and Girls Foundation (www.wgfpa.org) is to achieve equality for women and girls, now and for generations to come. About The Work Family Strategy Council: The Work Family Strategy Council is a collaborative of 15 national organizations dedicated to promoting policies that help ensure all working people can care for themselves and their loved ones without jeopardizing their jobs or economic security. The groups are experts on paid family and medical leave, paid sick days and other issues of importance to working families, and they are driving successful organizing and advocacy efforts to secure policy changes at the local, state and national levels. Together, the council's work improves life for millions of people across the country. Member organizations are: 9to5; A Better Balance; Black Women's Roundtable of the National Coalition on Black Civic Participation; Center for American Progress; Center for Economic and Policy Research; Center for Law and Social Policy; Family Values @ Work; Institute for Women's Policy Research; Labor Project for Working Families, in partnership with Family Values @ Work; Make It Work Campaign; MomsRising; National Domestic Workers Alliance; National Partnership for Women & Families; National Women's Law Center; and Restaurant Opportunities Centers United.